This driver is the best driver that you've never heard of. Fourteen is a company out of Japan that's been around for 30 years, but it's just now bursting on the scene in America. You are going to want to get this driver in your bag before your playing competitor does. The driver head looks smaller than the other modern drivers, but it's an optical illusion. It is actually a 460cc titanium head. The traditional shape makes the head look smaller at address, which I like. The head is a four-piece design with a high back, which Fourteen claims will keep you from dropping your right shoulder. I can't testify to that, but I can tell you that this driver is very accurate. The best thing about the driver is the sound and feel. This is like no other driver you've ever felt before. Most of the modern huge heads give you very little feedback with a non-pleasing sound. This is not the case with this JC 909. The sound is a nice mellow tone with a very satisfying feedback in your hands. You know how you always remember that iron or wedge shot that you hit pure and it felt like butter? This driver gives you that same sweet feeling on almost every swing. 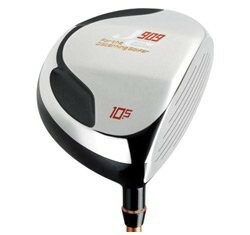 I would recommend this driver to all golfers, with one word of warning: The shaft, at 46.5 inches, is a bit longer than your typical driver shaft. This may take a little getting used to, but the result will be longer drives then with your previous driver.